The New Venture Players’s production of Kindertransport, written by Diane Samuels, opens tonight at Brentwood Theatre at 8pm. Tickets available on the door or in advance through the theatre’s website or box office 01277 231265. It’s showtime! The Dresser performs this week at Brentwood Theatre - Thursday 28-Saturday 30 March at 8pm - Ronald Harwood's classic - to be greatly enjoyed by anyone involved in/in love with the theatre. Set in 1942 at the height of the blitz, Sir is preparing for his 227th performance of King Lear - but he can't remember the first line … will Norman, his trusty dresser perform a miracle and get him into costume and makeup ... and onto the stage? The show must go on! This tender bitter-sweet love story to the theatre will make you laugh - and perhaps shed a tear. Its quite a play, with dressing room drama and snippets of King Lear. We have live timpani, a wind machine, knights with halberds... and so much more. An array of colourful characters will be brought to you by our very talented actors (Brentwood and Havering based) - working their socks off - who all share Sir's dream … a full house! So this is where you come in - we hope to welcome many of you to Brentwood Theatre this week - please tell your friends! PS It's tender, touching ... and tremendous! Local artist Adrian Henderson's beautiful 2019 calendar is now on sale. It features thirteen lovely cats all drawn in pastels. The cost is £10 pounds each, plus £2 if you would like your calendar posted to you. Adrian says that profits from the sales will be divided between his church and a cats' protection charity. You may remember that the 2018 calendar featured steam locomotives - next year wiil feature dogs. If you would like to buy a calendar, you can email Adrian at a.henderson1943@yahoo.com or call him on 01708 370649. Kytes Theatre Group come to Brentwood Theatre 25-27 October with Alan Bennett’s hilarious autobiographical play about Miss Shepherd who parked her van on his driveway for a couple of nights and stayed for fifteen years! The Lady in the Van - tickets £13 Shows start at 8pm. The BC Drama Festival of one act plays is now running at Brentwood Theatre. Its selling well so best to check availabililty to avoid disappointment! To celebrate the Queen's Theatre Hornchurch turning 65 they are having a special 70's themed party and would love for you to come. Dress up, dance the night away and raise vital funds for your local theatre! The night starts with a live band, made up of actors from previous musicals, performing the very best tracks of the decade to dance along to, followed by a disco playing till late. As a not-for-profit organisation and registered charity, all funds raised will go towards helping fund the theatre’s wide-reaching, unique programme of live theatre and community and education projects. This includes working with young people and the community, investing in and nurturing artistic talent and making theatre accessible. Art Exhibition - time to vote! Our 2018 Art Exhibition continues in the foyer of the Queens Theatre, and the people of havering are invited to vote for the People's Favourite Award. There are some beautiful works on diplay, some in oil, some watercolour, acrylic, pastel, pen and ink, fineliner - and on different materials including board, paper and silk ... why not come along and see what some of our local artists have created? To whet your appetite, here are a few examples. The exhibition runs until 8 September, so still plenty of opportunity to visit. We are pleased to announce that this year's Havering Open Art Exhibition is now on display at the Queens Theatre, Hornchurch. There are a great variety of paintings on display, worked in various mediums, and we encourage everyone to come along and see the sort of work that is being produced in our borough. Copies of the catalogue of entries are available at the exhibition and downloadable here for your perusal. We hope that you will have a chance to visit the display, which is open throughout theatre opening hours until 8th September, and look forward to meeting many of you during the course of the exhibition. There is a competitive element, including the People's Favourite picture, so why not bring the family and have your vote! Opera Favourites at The Old Chapel, in Upminster which was scheduled for Sunday 29th July at 2pm is postponed. A new date will be arranged shortly. 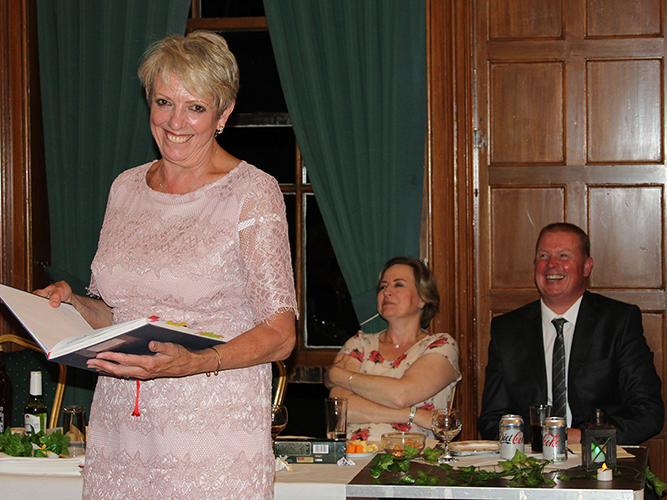 There was much fun to be had at Langtons House last Thursday night, 12 July, as this year's Havering Drama Festival drew to a close with an evening of celebration and awards. Festival adjudicator Louise Manders gave a lively round up, with hononoured guests The Mayor and Mayoress of Havering, Councillor Dilip Patel and Councillor Nisha Patel, and Chairman of Havering Arts Council Paul Kelly present. This year six groups took part with a wide range of plays from Shakespeare, to Alan Ayckbourne and Oh What a Lovely War. They were competing for fourteen awards, one of which was new this year - The Beryl Scholfield Memorial Cup for the Most Memorable Theatrical Moment. It has been given to Havering by Louise Manders and family in memory of her mother. The full list of nominees and winners can be viewed here. Vernon Keeble-Watson was the MC for the evening and music was provided by Tom Hind. Enjoy an evening of jazz in the barn with exciting trio Without Words. 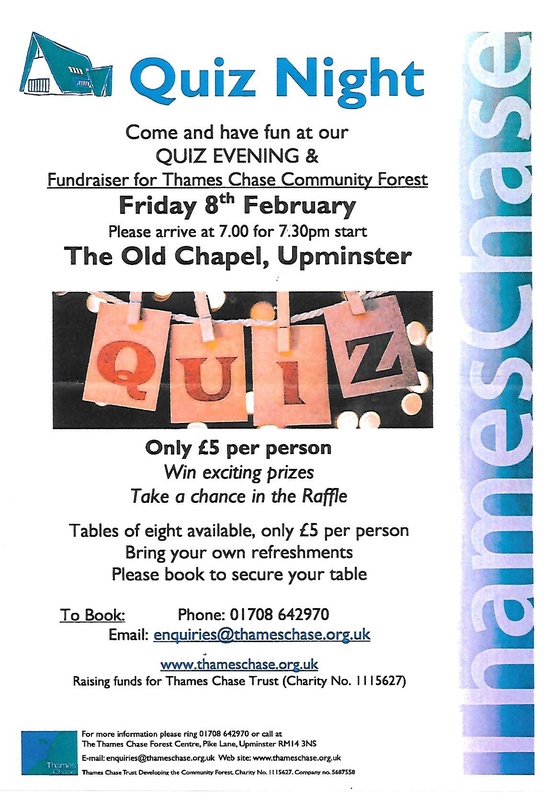 The event is on 20 July at Thames Chase Forest Centre, and is a fund raiser for Thames Chase Trust. Tickets are £12 - booking essential - tea and coffee available, but bring own drinks and nibbles! This glorious summer weather is perfect for enjoying an open air show - so why not come along to the beautiful Raphael Park and see Romford Summer Theatre’s current production of The Taming of the Shrew? This very funny play performs on The Rockery at 8pm tonight, with matinee July at 3pm. Further evening performances on 5,6 & 7 July at 8pm. Evening shows offer interval catering, and parking on the field via Parkway entrance. NB matinee has no catering, although the park cafes are open. And no inside parking on a Sunday afternoon - cricket in progress! And this week your theatrical entertainment from our member groups is Spotlight with Madame Blavatsky Lives! After a great last night it’s playing for another two performances: tonight and tomorrow, Friday and Saturday 1 and 2 June, at The Collier Row Methodist Church Hall, Clockhouse Lane, RM5 3QP. This production is another entry in this summer’s Havering Drama Festival - look them up on FaceBook! This week Spotlight Theatre Company perform Madame Blavatsky Lives at the Methodist Church Hall, Clockhouse Lane, Collier Row. Performances are on Friday and Saturday 1st and 2nd June at 7.30pm. It is the fourth play so far which is entered in this year’s Havering Drama Festival. This play, written by Joan Greening, is described as a funny and poignant comedy .. see Spotlight’s Facebook page for more information. Wesley Players next play opens tonight in Upminster. WI Blues is described as 'a full-length drama - with plenty of comedy to lighten the darkness!' Tickets available on the door or in advance on 07708 214742. Havering Arts Council AGM will be held on 19th June at Fairkytes Arts Centre, starting at 7.30pm. Why not come along and find out more about what we do - and give us your suggestions! Theres a War on ! College Players’ production of Oh What a Lovely War opens tonight at South Weald Parish Hall and promises to be a great evening’s entertainment with live music and a cast of thousands ... well, over twenty, but they do rush about! Looking forward to seeing the show. Break a leg! Havering Arts Festival 2018 will run from 26 April to 29 July. It gets underway with Ad Hoc Players performing Catherine Cookson's The Fifteen Streets at Brentwood Theatre, 26-28 April. The festival features music, drama, dance and so much more. Check out our calendar of events and watch this news feed and blog. And Havering Arts Festival opened last night at Brentwood Theatre, with with Ad Hoc Players performing Catherine Cookson's The Fifteen Streets which runs 26-28 April. Huge congratulations and well wishes to leading actor Neil Gray who managed to perform, despite the fact he should have been in bed with his badly injured knee - living proof that the show must go on. This play also opens the 2018 Havering Drama festival which runs concurrently with the arts festival. The arts festival features music, drama, dance and so much more. Check out our calendar of events and watch this news feed and blog. Sounds a gift from BBC! The BBC has made its sound effects archive available to the public for free use for the first time. The archive incorporates effects used by the corporation's radio output since the 1920s - in the region of 16,000 sound files! I’ve had a quick surf and it’s really good - thanks Auntie. New Venture Players' current production Pygmalion has its final two performances at Brentwood Theatre on Saturday 10 March. Matinee performance at 2.30pm and evening at 8pm. Some tickets still available call 01277 200305. Elmwood Art Society is hosting a watercolour demo by Heather Brown on the 26th March 2018 at the Elm Park Baptist Church Hall starting at 7.30pm. Non members are very welcome to come along - there is a £5 entrance fee. Havering Arts Council wishes all our members, and those who support us, a very Merry Christmas and lots of luck in the New Year! Talking of which, if you haven't yet sent us your show/event dates for the calendar and/or inclusion in the Arts Festival Brochure, you are overdue - better make it your New Year's resolution! Send us dates (even provisional) and any artwork for immediate display. Looking forward to working with you in 2018. All good wishes from Paul, Jill, Candy, Ian, Chrissie and Claire. Christmas is coming to Raphael Park! This Saturday, 9 December, how about popping along to Raphael and Lodge Farm Park for the Christmas Fair? It's the first of its a kind and a lovely idea - and there will be stalls and carol singing in Raphael Park and steam train rides for the Children in Lodge Farm Park. See you there! Guildonian Players’ show this week is selling out! ‘The Happiest Days of Your Life’ is set in 1948 and was made famous in the 1950 film starring Margaret Rutherford, Joyce Grenfell and Alastair Sim. The show is the precursor to the more anarchic St Trinians films and is clearly appealing to audiences, with barely any tickets left for the Wednesday-Friday evening performances. There is some availability for the Saturday matinee and good availability for Saturday evening, so we encourage everyone to drag themselves away from the Saturday night tv and enjoy this whimsical and very funny farce in your local live theatre. Reserve seats on 01708 782118. Venue: The Little Theatre, Harold Wood Methodist Church, The Drive, Harold Wood, RM3 ODU - 3 minutes from Harold Wood Station and buses, parking at venue in car park or on street. 8-11 November, 8pm nightly, plus 2.30pm Saturday matinee. Spotlight are holding a Spooky Halloween quiz on 28 October 2017! The event takes place at Thordon Countryside Centre, Thorndon Park North, The Avenue, Warley, Brentwood CM13 4RZ. 7.30pm for 8pm start with Fish or Chicken and Chip supper, you are invited to bring your own drinks, although Thorndon cafe will be open for hot drinks. There will be a prize for best fancy dress, a raffle, and the evening will finish at 11pm. If you would like to book tickets (£10 each) please ring Emma on 07981 320386 for preference of chicken or fish before Thursday 26th Oct - although late choices possible. A spooktacular way to help Spotlight raise funds for future productions! This week two of our local groups are performing plays - College Players with ‘Gaslight’ at Brentwood Theatre, and Wesley Players with ‘Trap for a Lonely Man’ at the Methodist Church Hall, Upminster. Anyone venturing further afield could see our Paul Sparrowham at Chelmsford in The Cat and and The Canary - now that’s a varied bill! Several Havering drama groups are competing in the long running Brentwood Catholic Theatre Club Festival this week at Brentwood Theatre. Each evening, and on Saturday afternoon, there is a varied bill of one act plays which are adjudicated at the end of each session. It's also an opportunity for local playwrights to have their work performed and this year a bumper crop of original works is on display. To see some great examples of local talent, pop along to the Brentwood Theatre from Wednesday 20 - Saturday 23 September - just £10 a ticket! And we're off to The Brents tonight! Paul Kelly and Chrissie O’Connor will be representing Havering Arts Council at Brentwood Theatre’s 2017 Brent Awards. Several Havering groups and actors are nominated and we wish everyone good luck. We are sponsoring Best Supporting Actress in a Musical and Paul will make the presentation - on opening the magic envelope tonight … watch this space! Limited edition calendar - an ideal Christmas gift! 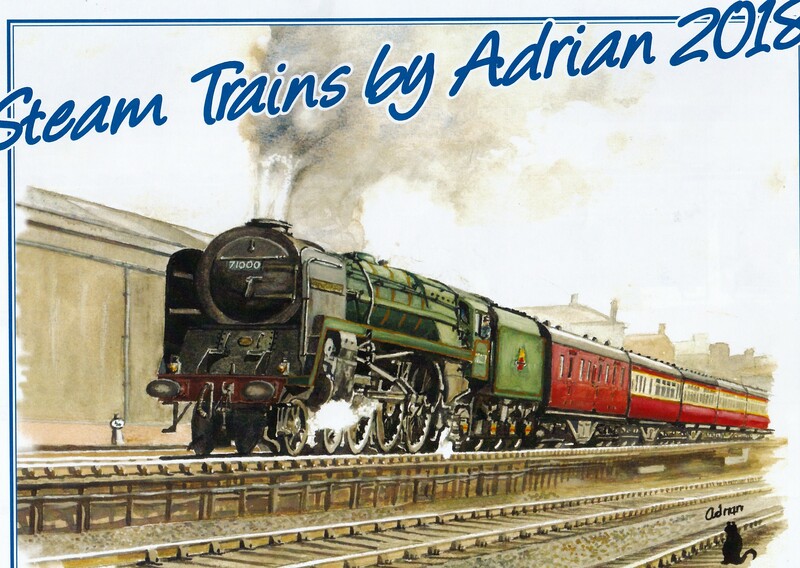 Local artist Adrian Henderson has created a beautiful calendar which features a collection of his watercolour paintings of steam engines. Printed by the Brentwood Community Printers - the owner just happens to be a railway enthusiast - the A4 sized calendar will be available around the end of September. Priced at just £12, each calendar will be signed and numbered by the artist as a limited edition. The profits will be going to charity. The paintings are all of steam trains from the 1950's and 60's and cover a range of locomotives with all their dirt, based on old black and white photos. In the final award of this year's Havering Open Art Exhibition, the result of the People's Favourite is ... a dead heat! So two awards have been made, to Joyce Eade for Bumblebee, and Susan Walsh for Bathtime. Congratulations to Joyce and to Susan, and to all the other award winners. Thanks to all those who voted for their personal favourite. There's just one day left to see Bumblebee, Bathtime and nearly 40 other wonderful works of art in the foyer of the Queen's Theatre. Havering Open Art Exhibition finale! The Romford Recorder today featured the Havering Open Art Exhibition in a full page article, with photographs of some of the artists with their works, and listing the winners. After a three week run, the exhibition is now in its final days, so if you haven't seen it yet, pop along to the Queens Theatre today or tomorrow, Saturday 2 September. PS The Peoples Choice award is to be announced this afternoon ... watch this space! Final week of Havering Open Art Exhibition - winners announced! And its week three of the Havering Open Art Exhibition at The Queens Theatre, Hornchurch - and some winners are announced! Thirty nine local artists, many of them members of Havering Arts Council, have combined their talents to present a colourful exhibition over the past three weeks at Queen's Theatre. Owing to the popularity of the exhibition and the numbers participating there have been three separate displays. The final week's exhibition, which includes all of the winning pictures, will be on show at the Theatre until Saturday 2nd September. Judged Best in Exhibition was a vibrant take on the countryside by Jill Mackness, of Collier Row. Other prize winners were Dee Spencer-Perkins for her charcoal and pastel drawing of Winston - a chicken with attitude, inspired by the actor Ray Winstone; Diana Hart with her watercolour of a kingfisher, Catch of the Day! ; Yvonne Englefiled with her mixed media Autumn's Approach; and Jane Nicholas for her oil painting Fire and Ice. Paul Kelly, Chairman of Havering Arts Council, said that the quality of the work entered into this year's Havering Open Art Exhibition has been extremely high, and the range of subject and materials have made for an excellent rolling exhibition. There is a high level of interest in the visual arts in the borough. There is yet the People's Choice Award to be judged, so get yourself along to Queens and let us know your favourite picture - every vote counts! Havering Art Exhibition - its week two! There are prizes to be won and judging takes place next week. There is a special prize to be chosen by the public, so do go along and vote for your favourite picture. This week's catalogue can be viewed here - do pop along to the Queens Theatre and enjoy some of the splendid works created by our local artists. Havering Art Exhibition now open! This year's Art Exhibition opens on Monday 14 August and will run until Sunday 3 September in The Queens Theatre, Hornchurch. It has a competitive element as it incorporates the Havering Over-60's Art Competition, plus Young Artists and Open Best in Exhibition awards categories. It's a great opportunity for Havering's talented visual artists to exhibit their works so do pop along and enjoy! This year's art competition will take place with an Exhibition running from Monday 14 August to Sunday 3 September in The Queens Theatre, Hornchurch. It incorporates the Havering Over-60's Art Competition, plus Young Artists and Open Best in Exhibition awards categories. It's a great opportunity for Havering's talented visual artists to exhibit their works so pop along and enjoy! Havering Singers welcome new members! Havering Singers is open to all who enjoy singing, whatever their musical experience, so if you are looking for a friendly choir and the opportunity to make music, please come and join them. You will be made very welcome. Havering Singers are currently looking for new voices in all sections. Fiddler on the Roof is coming! Tickets available from the Queen's Theatre box office on 01708 443333. HAC Drama Festival Gala Night - party at Langtons! A great night was enjoyed by all at Havering Drama Festival's Gala Night (13 July, 2017). Adjudicator Jan Palmer-Sayer of the Guild of Drama Adjudicators gave a lively and entertaining resume of the productions involved, before announcing the nominations and awards. The drama festival, which runs alongside the Havering Arts Festival, this year featured seven plays which took place between April and July. The Deputy Mayor of Havering, Councillor Dilip Patel, and Chairman of Havering Arts Council, Paul Kelly presented the trophies and certificates in a warm party atmosphere. As the evening progressed, the excitement mounted, and the overall winning show was Roxy Krasner and the Case of the Pink Belle, produced by College Players and directed by Nick Wilkes, who also won the award for Best Director. For a full list of results see here. Lots of our local groups are taking part, so why not pop along and give them some support. Our annual peripatetic festival of full length plays has been running since April, with seven groups taking part. The final entry, Romford Summer Theatre's 'A Midsummer Night's Dream' is in its second week and marks the last of this season's productions. The plays taking part were The Vicar of Dibley (New Venture), Roxy Krasner (College), Prescription for Murder (Wesley) Oh Carol (Ad Hoc), The Momologues (Spotlight), Ladies' Day (Guildonians) and The Dream. Festival Gala Night takes place on Thursday 13 July at Langtons, Billet Lane, Hornchurch, at 8pm when Adjudicator Jan Palmer Sayer will preside over the award ceremony and MC Vernon Keeble-Watson will orchestrate the celebrations.